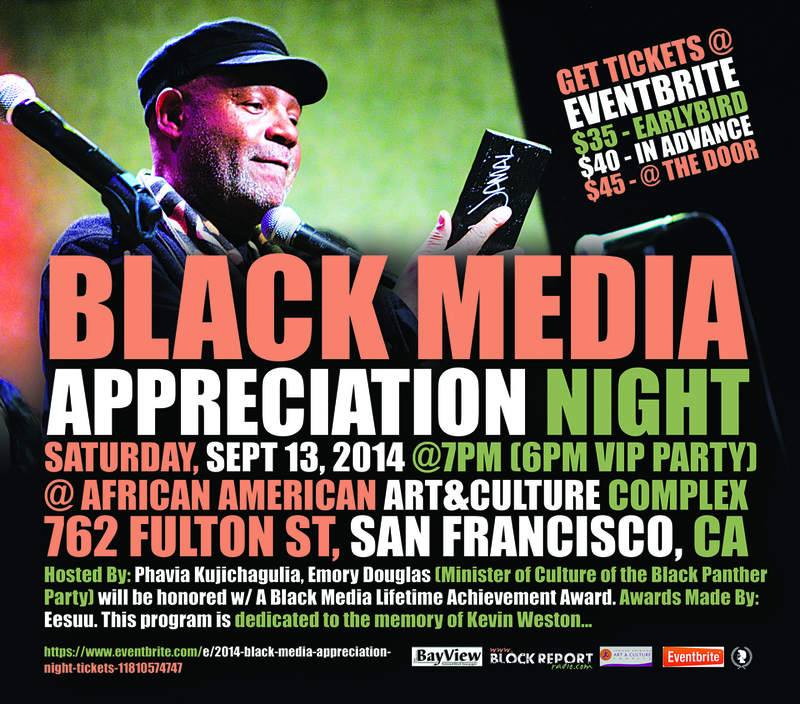 Every two years, Block Report Radio and the SF Bay View newspaper get together to sponsor Black Media Appreciation Night, a night when we honor the very best in Black media from around the Bay Area. 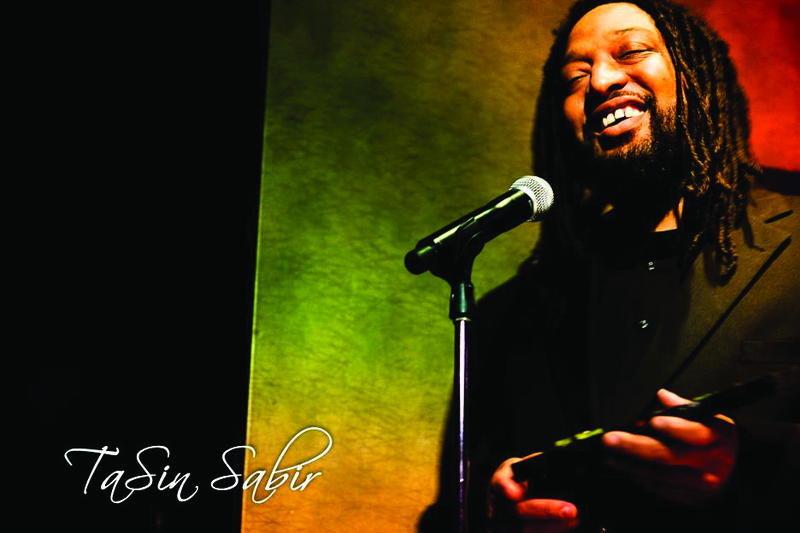 BMAN 2014 is Saturday, Sept. 13, 7 p.m., at the African American Art and Culture Complex (AAACC), 762 Fulton, San Francisco. Click HERE for tickets. djialli (griot), musician and author Phavia Kujichagulia, who will be hosting and performing – back by popular – with her band Ma’at, who brought down the house at never-to-be-forgotten Black Media Appreciation Night 2012. 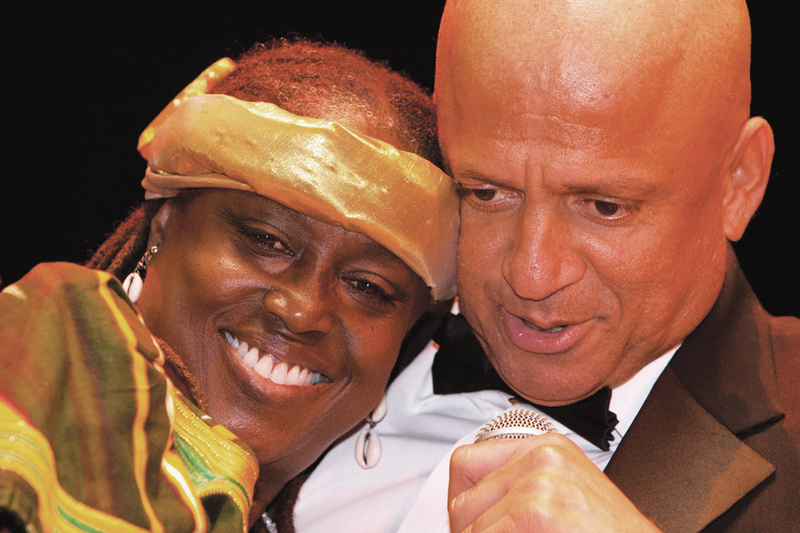 Ma’at is composed of Alton McGriff (bass), Ron Williams (guitar, djembe), Val Serrant (djembe, talking drum) and Phavia Kujichagulia (spoken word, trumpet, djembe). Visual artist and sculptor Eesuu Orundide will be creating the unique individual pieces of art that we will present as awards. Malik Seneferu, who made the coveted 2012 awards, is working on a special one for Emory Douglas. We will present master artist Emory Douglas, the former minister of culture of the Black Panther Party, with a Black Media Lifetime Achievement Award for his almost half century of creativity and dedication to bringing Black people into higher political consciousness. We will also honor the life and legacy of the beloved journalist, editor and mentor of a whole generation of media-makers Kevin Weston, our top honoree at BMAN 2012, who recently passed away much too soon. And in hopes for their speedy return to their historic San Francisco landmark home, we’ll present the revered Marcus Book Store, the oldest Black book store in the country, with a lifetime achievement award. There will be food, drinks, music and a helluva lot of media-makers in the house on Saturday, Sept. 13, 7 p.m., at the African American Art and Culture Complex, located at 762 Fulton in San Francisco. Will you be there? Get your tickets now (http://www.eventbrite.com/e/black-media-appreciation-night-tickets-12432639359?aff=es2&rank=2) because seating is limited. See you there.